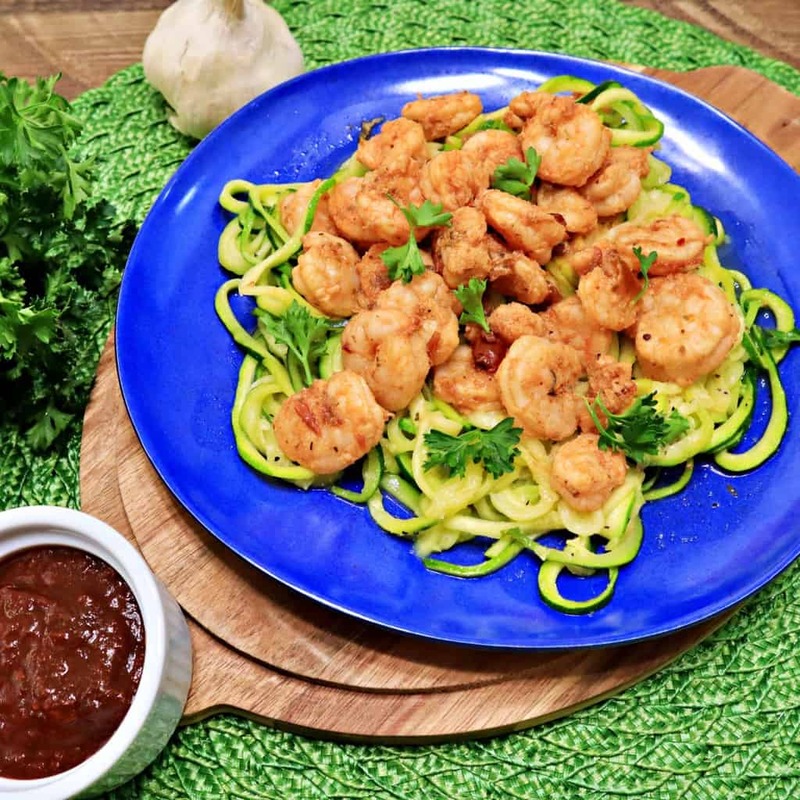 This Keto Zesty Shrimp Zoodles Recipes has a kick to it, thanks to the Chipotle Pepper marinade that we prepare. Overall, this dish is a nice and savory Keto Dinner that harbors notes of garlic and smokey pepper. I think that this one is best eaten fresh, unless you plan to store the shrimp in the refrigerator, and make the Zoodles fresh later on when you re-heat the shrimp. For whatever reason, I am generally not a big fan of Zucchini Noodles (aka Zoodles) even though I really like to eat Zucchini. Maybe it’s because I don’t really think that their texture is a good replacement for things like spaghetti noodles when people try to use them to replace that in typical pasta dishes. Zoodles are just a bit too watery and too soft in texture to convince me that they are pasta. In a dish like this I really like them, because they are more like a bed of sautéed vegetables. 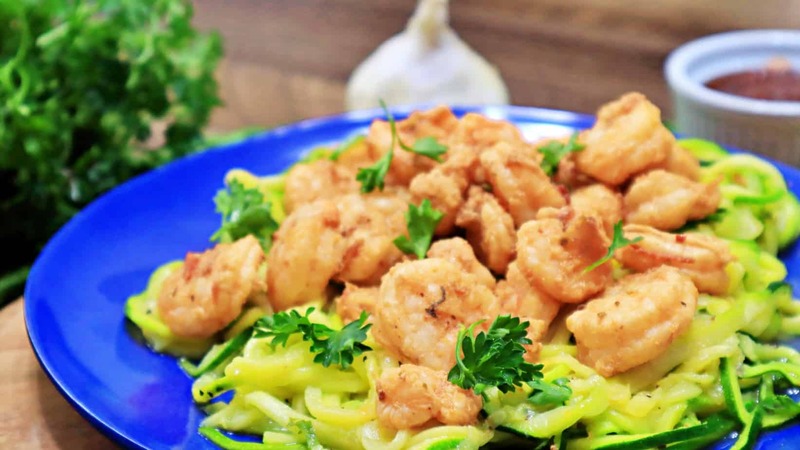 The trick to keeping the Zoodles from being too moist is to make sure that you remove them from the butter and rendered moisture as soon as you are done cooking them, and same goes with the shrimp. I typically use tongs, or a slotted spoon to scoop both of these out of the skillet to help prevent too much moisture from taking over. If you just pour these out of the skillet onto the plate there will be too much liquid, and that’s really not even needed for flavor. There will be plenty of flavor without all of those drippings. When shopping for the canned Chipotle Peppers, be sure to read the labels to compare ingredients. Some of them will have a tiny amount of sugar in their seasonings which seems to be almost unavoidable, though hardly any of the sugar will be retained in the dish. There are some however that are soaking in mixtures with Canola Oil or Soybean Oil, and some that even have Corn Starch and other additives. We will provide a link to the cleanest one we can find in the Ingredients List, but if you know of one that doesn’t even have a touch of sugar in the spices please let us know. We would love to hear your thoughts on how you would change this dish up, or ways that you would prepare it. Leave us some comments at the bottom of the page! Rinse off 1 Pound of Peeled and Defrosted (if previously frozen) Shrimp and place in a medium mixing bowl. Add 4 Tablespoons of Chipotle Peppers in Adobo Sauce, along with 1 Tablespoon Granulated Garlic, 1/2 Tablespoon Onion Powder, 1 Teaspoon Oregano, 1/2 Teaspoon Thyme, and 1/2 Teaspoon Pink Himalayan Salt. Mix all of the ingredients together, and set aside to marinate while preparing the Zucchini Noodles. Cut the ends off of 4 medium Zucchini so that they are as flat as possible on both ends. Using a vegetable spiralizer like the Veggetti Pro, spiral cut the Zucchini into curly Zucchini Noodles (aka. Zoodles). In a Large Skillet over Medium-High Heat melt down 3 Tablespoons of Grass-Fed Butter, and then add the spiral cut Zucchini Noodles. Season the Zucchini Noodles with 2 Teaspoons of Sugar-Free Lemon Pepper Seasoning, 1/2 Teaspoon of Granulated Garlic, and 1/4 Teaspoon of Pink Himalayan Salt. Cook the Zucchini Noodles until just tender, and remove from the skillet, leaving the rendered moisture behind. It is important not to over-cook the Zucchini because it will become excessively watery and too tender to hold a noodle shape if you do. Only a few minutes on the stove should be plenty of time to get the job done. Remove the rendered moisture from the Skillet and wipe down with a paper towel before returning it over Medium-High Heat and adding 1 Tablespoon of Avocado Oil. Add the Marinated Shrimp, but do not add the liquid from the marinade to the skillet. We use tongs to take the shrimp out of the bowl, while leaving most of the marinade behind. Cook shrimp over Medium-High Heat for about 5 minutes, or until completely cooked. Do not cook for too long or else the shrimp will begin to toughen up in texture. 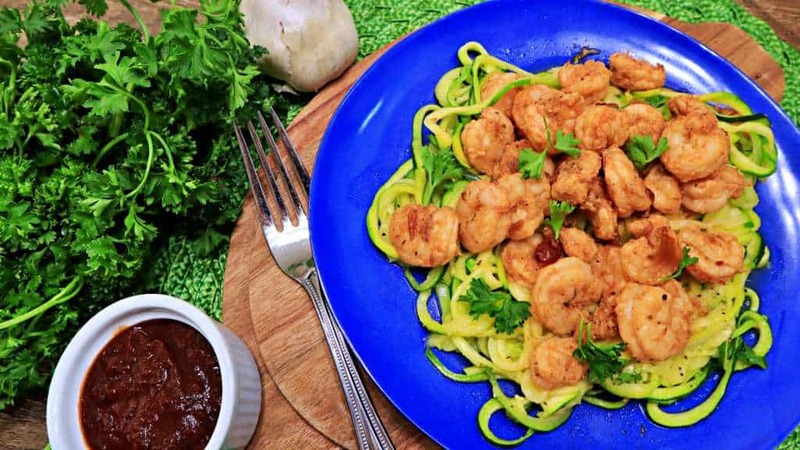 After the Shrimp are fully cooked you can either plate the Zucchini Noodles and top with the Shrimp, or toss the Zucchini Noodles back into the Skillet with the Shrimp for a tiny bit to warm them back up. I think that Shiritaki Noodles make a much better Spaghetti replacement too. This dish had a great taste, but honestly it is too spicy. I am from south Louisiana, and I like heat, but this was insane! Could it just be the brand of peppers in sauce that I used? I was limited in choices at my supermarket. They didn’t have a mild vs spicy option. Hey Tommy, I’m curious with the Marinade if you removed the Shrimp from it when you cooked them, or if you poured the whole marinade into the pot. When we made ours we removed the shrimp from the marinade in the bowl when we transferred them to the stove. That could make a difference. Otherwise I wonder if the brands you had at your store were just a lot hotter than ours. Yes, I did pour it all in. It makes sense that would make a difference. I will try it again. Thank you for the delicious recipe! First time cooking Zoodles and thanks to your directions, they were not the soggy heap.I had always anticipated. Also first time cooking with the peppers and glad I tasted…I enjoy a bit of heat but WOW were they hot! I ended up using just two peppers and rinsed them well prior to mincing! The final dish was very tasty and needed no additional sauce as I had thought it might. This is a great base recipe and I’ll definitely continue to make, modifying the ingredients to better suite our preferences.